"Looks great" isn't the same as "plays great"
Looking back on preview coverage from this and other sites, there seems to have been a lot of excitement from critics leading up to the release of Robert Ludlum's The Bourne Conspiracy. After playing through it from start to finish, though, it's hard to understand why. The Bourne Conspiracy is aggressively average, offering up an adaptation of The Bourne Identity that - while mostly enjoyable - fails to do anything that plenty of other games haven't already done better. Oh, sure, it's stylish. If there's one area Conspiracy excels in, it's replicating the rapid, brutal pace of the Bourne films, with tightly directed interactive cutscenes and lightning-fast, visceral martial-arts action. As amnesiac super-assassin Jason Bourne, you'll constantly be thrust into ambushes, races against time and sudden, life-or-death quicktime events, all designed to keep you on your toes. But the polish starts to wear off when you realize just how repetitive it all is. Let's start with the fistfights. Easily the best part of the game, these throwdowns are triggered whenever you get rushed by unarmed enemies, at which point you're forced to battle them one at a time, like in an old kung-fu movie. (This'll also happen whenever you meet a boss, or whenever you rush and disarm a gun-toting enemy - which can be a bad idea if his buddies still have their guns.) These look flashy, and the shaky camera gives them a satisfyingly brutal feel, but eventually the coolness wears off and you'll settle into an even ebb-and-flow of busting out simple, three-strike combos with two buttons, and then blocking while your opponent unleashes his own three-hitter. You can hold down a button to execute a powerful kick, too, but these only add so much. The real fun comes from Takedowns, context-sensitive attacks that you can use once you've landed enough attacks to fill one of the bars on Jason's adrenaline meter. Tough enough to instantly destroy a lesser enemy (or up to three, if you've filled your meter enough) or deal serious damage to a boss, these cinematic moves will frequently use whatever you're standing next to, meaning you hurl enemies face-first into vending machines, the edges of desks or down flights of stairs. And if you see any glowing objects nearby, you can inch your way over to them, pick them up and use them to beat your opponent's face in. True, you're not actually controlling these beatdowns - you just push a button to make them happen. But they still look awesome. Some of your enemies can pull Takedowns off as well, at which point you'll be thrust into a brief quicktime event that - like all of the game's quicktime events - is telegraphed by a distinctive whistling noise. And once you know to listen for it, escaping a massive beatdown is as simple as getting ready to hit a single button - which, again, is all that most of the game's quicktime events require. 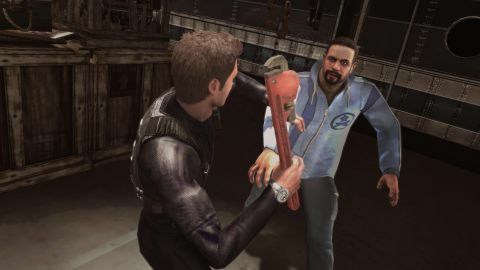 While it's the best part of the game, though, the hand-to-hand fighting is really there to provide a break from all the third-person shooting. You'll spend most of Conspiracy guiding Jason through linear environments, ducking behind cover points (a lot of which are destructible) and popping up to trade shots with a wide assortment of interchangeable goons. Sometimes they won't notice you (at which point it's possible to sneak up behind them and administer a stealth Takedown), but most of the time you'll be ducking hails of bullets, waiting for the right second to pop up and squeeze off a shot. It's fun, but it's pretty bare-bones stuff, and it's nothing we haven't already seen in games like Dark Sector, Rainbow Six Vegas or Gears of War. Unlike those games, though, Conspiracy confines your arsenal to just two guns at a time - a pistol and a rifle-type weapon - with no grenades or other alternate weapons. Description Essentially a Matt Damon-free adaptation of The Bourne Identity, this spy story delivers average - but extremely stylish - shooting, punching and occasional driving action.